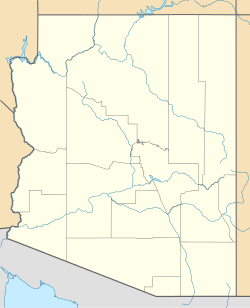 Geronimo is a populated place located on Highway 70 between Bylas and Fort Thomas west of Safford in Graham County, Arizona. Geronimo lies at an elevation of 2,723 feet (830 m). Geronimo was named after the famous Apache chief Goyaalé, better known as Geronimo. Camp Thomas, the U. S. Cavalry began its management of the Apache Indian Reservation along the Gila River, was originally located here in 1876. The camp was later moved east to what is now Fort Thomas. Geronimo was once a stop on the Arizona Eastern Railway and had an operating US Post Office from April 30, 1896 until May 31, 1956. ^ a b "Feature Detail Report for: Geronimo". Geographic Names Information System. United States Geological Survey. This Graham County, Arizona location article is a stub. You can help Wikipedia by expanding it. This page was last edited on 6 November 2018, at 00:07 (UTC).